The painter considers Can I Stay Here? 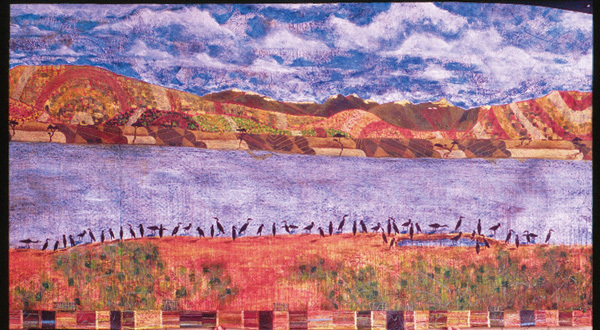 (above), a 51/2--foot-wide by 8-foot-long landscape of a lake in Kenya, his masterpiece (“—so far!” he adds, with a laugh.). A sliver of an African tribal textile accents the bottom of the canvas. Silhouetted herons draw your eye to the water’s edge. “My uncle traveled to this lake and took a photograph of it that I really liked,” he says. “I wrote CAN I STAY HERE? in Swahili in marker underneath the clouds, which turns it into a ‘living’ painting. The older the painting gets, the more the words will bleed through the clouds. What I love about painting is the process: The actual painting is just a byproduct. For the last five years, all I’ve done is stay home and paint. I have 10,000 paintings in my head that I just don’t have the time to paint!” Can I Stay Here? costs $1,000. Contact painter Douglas Smith via his website, douglasmith.com. You can also find him in booth #72 (on 13th Ave. between Johnson and Irving streets) every First Thursday in the Pearl.